About five miles outside Pisa in the midst of modest farmhouses and meager olive groves you’ll find the magnificent Certosa di Calci. This bubbling baroque masterwork compares to its surrounds like a spaceship to a FIAT 500, but architecture is just the beginning. The Certosa di Calci, founded in 1366 and renovated in the 17th and 18th centuries, was a Carthusian monastery of the Order of Saint Bruno, a Roman Catholic order of cloistered monks. If you don’t know what “cloister” means, just remember that cloistered people live their lives as if they were in an oyster, shut off from the rest of the world. Carthusian charterhouses had very strict rules or Statutes and were headed by a prior and inhabited by monks and lay brothers. Above the vestibule you’ll see a statue of Saint Bruno and the words: O Beata Solitudo, O Sola Beatitudo, O Joyous Solitude, O Solitary Joy. A spy hole in the sturdy wooden doors has iron bars across it just to make sure that no outsider can get as much as a hand into this sacred and inviolable place. And yes, the former inhabitants are all rolling in their graves at the very thought of women treading on their no-girls-allowed-ever turf. The ticket office is in the monastery’s old frantoio, and the olive press, a huge screw made from a tree trunk, is still there. You enter a rectangular lawn delimitated by buildings, a hermetic dimension of symmetry, solitude and contemplation that still manages to be colorful, mysterious and whimsically fun. A double loggia to the left has real and frescoed windows and a folly to the right has mosaics made from lava, seashells and broken dishes. There are small horned devils at the top of each pilaster and sculptural monks with their shaven tonsures and rope-cinched habits recline in grotto alcoves below. Monk-ey doo: the tonsure: monk’s shaven heads symbolized humility and devotion. The central chapel is in white marble, crowned with a Madonna perched on a nimbus of boiling clouds. The monks could only “converse” with cats, the only animals that could come and go as they pleased from the Certosa. There are still many roaming the grounds today. Each monk lived in his own solitary cell off a long corridor. The cells had a revolving “turn,” where meals and other items would be placed so that monks could get them without seeing or being seen. The Certosa di Calci’s cells were quite large compared to other monastery’s. Each cell had an area for dining, studying and working, a kneeling stool for prayer and a bed. All cells had a fireplace, a privy and a second floor for storing firewood and such. Each cell had its own walled garden with a cistern so that the monks could grow flowers, vegetables and medicinal plants. The monastery had a beautiful pharmacy with a small window that people could come to from outside. The monks spent most of their days in their cells changing activity (prayer, work, work, prayer) following the toll of the convent bells. The monks would all eat together in the refectory, frescoed in such a way that the monks at the tables seem to turn as you walk down the room. On Mondays monks could enjoy a four-hour spatiamentum, walking and even talking with a fellow monk for half an hour so that at the end of the four hours each monk would have spoken with eight fellow monks. Twice a year monks could receive visits from immediate family members. Lay brothers, men who lived by the Order’s rules but had not taken vows, would spend less time in prayer and more time in manual labor like cooking, doing the washing and farming, but they too lived in silence. The monks would reunite in the chapel for matins, a night time prayer session that ended at dawn. The main chapel has been frescoed with quadrature, or illusionary architecture by Pietro Giarré. The optical illusionary floors are made from just three different colors of marble. 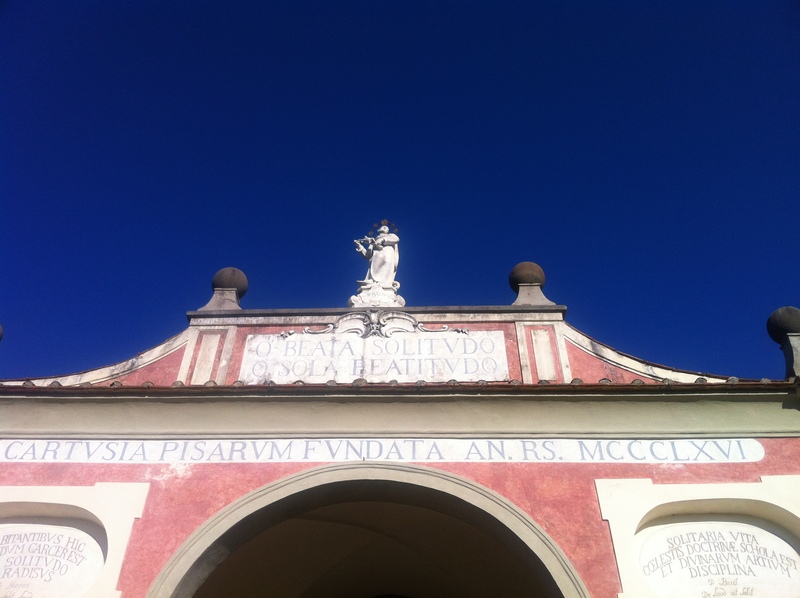 The artists who decorated the Certosa made a big mistake and frescoed musicians in the painted balustrade of a chapel. There were no musicians in this reign of Silenzio. The artist was reprimanded and the musicians were painted over, but their ghosts play on today. But there are probably a few ghosts of monks in the cloisters too. There may not have been many voices ringing down these haloed halls, but they are a riot of color. Marble, stucco, frescos and inlaid wood: no expense was spared in decorating the chapel, refectory, main cloister, pharmacy, library and the Grand Duke’s apartments. The grand Duke Pietro Leopoldo and his wife Maria Luisa visited the Certosa in the late 1700s. It was the first time a woman had entered the monastery and she served the monks herself. The monks were granted permission to speak when the Grand Duke came to visit but chose to remain in silence. Then Napoleon came along and sent everybody back home. The gates were closed and left to rust. In 1866 the convent was officially suppressed and became property of the Italian state. Some monks stayed on as caretakers of the fanciest parts of the buildings while the farming areas were readapted as a nut house, a girl’s school and a hospital for prisoners of war. The last monks left in 1972 and Calci is now partly a monument unto itself and partly a natural history museum.